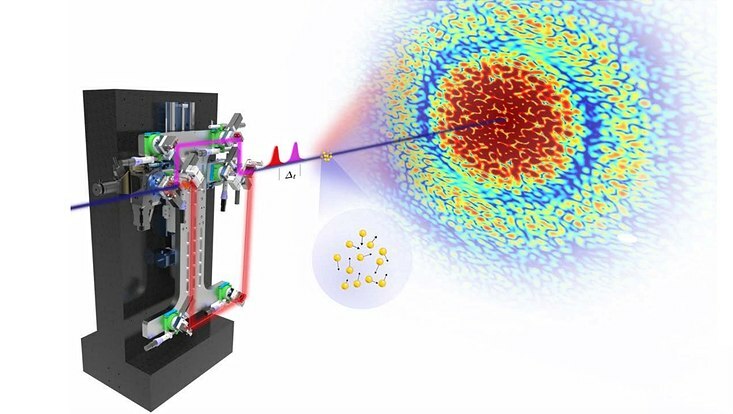 A team of scientists from SFB925 (Project B3), DESY, the Advanced Photon Source APS and National Accelerator Laboratory SLAC, both in the USA, have developed and integrated a new method for monitoring ultrafast movements of nanoscopic systems. With the light of the X-ray laser LCLS at the research center SLAC in California, they took images of the movements of nanoparticles taking only the billionth of a second (0.000 000 001 s). In their experiments now published in the journal Nature Communications they overcame the slowness of present-day two-dimensional X-ray detectors by splitting individual laser flashes of LCLS, delaying one half of it by a nanosecond and recording a single picture of the nanoparticle with these pairs of X-ray pulses. The tunable light splitter for hard X-rays which the scientists developed for these experiments enables this new technique to monitor movements of nanometer size fluctuations down to femtoseconds and at atomic resolution. For comparison: modern synchrotron radiation light sources like PETRA III at DESY can typically measure movements on millisecond timescales. Fig. 1: Autocorelator (split-and-delay) setup located at the XCS instrument of the Linac Coherent Light Source (LCLS). The X-ray path for the X-ray pulses split inside the device are denoted by the yellow and red lines, respectively. Fig. 2: Schematic of the split-and-delay experiment using autocorrelator instrument de-veloped at DESY. 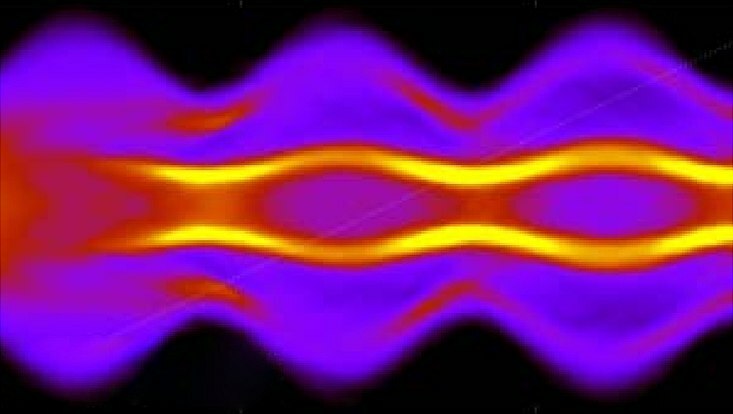 Ultrashort X-ray FEL pulses are split into two equal intensity pulses and de-layed prior they arrival at the sample position. The speckle patterns from the sample are collected during a single expo-sure time of the 2D detector. “This experiment paves the way to dynamics experiments of materials on atomic length and femtosecond-nanosecond timescales,” explains Gerhard Grübel, head of the DESY FS-CXS group. “Split-pulse X-ray Photon Correlation Spectroscopy (XPCS) can potentially track atomic scale fluctuations in liquid metals, multi-scale dynamics in water, heterogeneous dynamics about the glass transition, and atomic scale surface fluctuations.” Additionally, time-domain XPCS at FEL sources , especially at the European XFEL, is well suited for studying fluctuations in non-equilibrium processes that go beyond time-averaged structural descriptions. This will allow the elucidation of dynamics of ultrafast magnetization processes and can address open questions concerning photo-induced phonon dynamics and phase transitions. Nature Communications 9, 1704 (2018). Julian Struck finished his PhD on "Artificial Gauge Fields in Driven Optical Lattices - From Frustrated XY Models to Ising Ferromagnetism"